It’s bacon and beans most every day. I’d just as soon be eatin’ that prairie hay. The ole west loved them and movies depicted hungry cowpokes enjoying them over an open campfire. No barbecue is complete without them and kids enjoy them, not even knowing they are nutritious as well. So, don’t let another outdoor cooking opportunity pass by without Baked Beans. 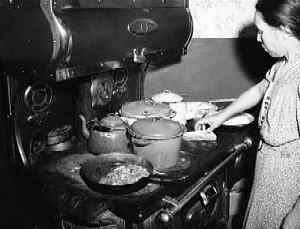 Everyone has a favorite family recipe or two handed down – keep that great tradition going. There is nothing wrong with trying new recipes, however, or creating your own favorite into a tradition. Wash and clean the beans. Cover with water and soak overnight. Drain. Add 2 cups water, mustard, pepper, salt, onions, brown sugar, molasses, pickle juice. Boil, covered, for about 1-1/2 hours. Beans should be wrinkled. Heat oven to 250. Cut salt pork into 1/2” cubes. Place in 2-quart bean pot. Cover with hot beans and their liquid. Sprinkle with pepper. Bake 8 hrs. covered, until very tender. When beans are baking for 6 hrs. add about 3/4 cup water or just enough to cover. Uncover the pot the last 1/2 hour. Old-fashioned flavor and worth the wait! 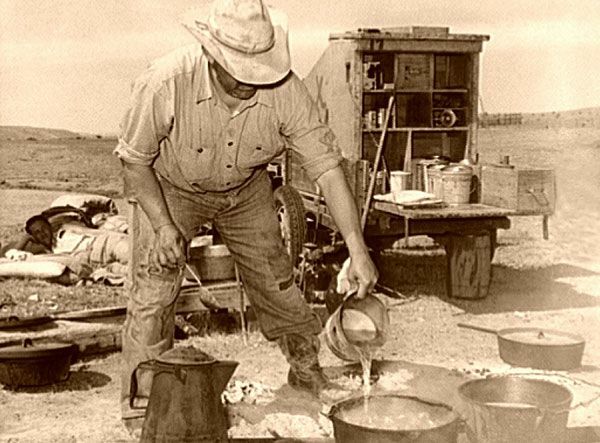 Cook of the SMS Ranch near Spur, Texas – Lee Russell 1939. Wash the beans thoroughly. Soak overnight in water to cover. Add salt, stir and drain, reserving the liquid. Preheat the oven to 350. Cut off a third of the salt pork and place it on the bottom of the bean pot. Add the beans. Blend the mustard, brown sugar, and molasses with the reserved bean liquid and pour over the beans. Cover and bake for 6-1/2 hours, adding water as needed. Uncover for the final hour of cooking. Taste and add salt if desired. You don’t have to live in Boston to enjoy these beans. Cook bacon until crisp. Drain. Combine with beans. Add tomato sauce onion, catsup, brown sugar, mustard, salt, and hot pepper sauce. Preheat oven to 300. Bake uncovered in beanpot for 4-1/2 hours. Some like it hot! Adjust that hot sauce to your liking. 4 slices bacon, cut into small pieces, 1/2 cup chopped onion, 2 1-lb. cans pork and beans, 2 tbs. brown sugar, 1-1/2 tbs. Worcestershire sauce, 1 tsp. prepared mustard. Cook bacon until crisp and drain. Reserve 1-1/2 tbs. of the drippings. Crumble bacon. Cook onion in the reserved drippings until tender but not brown. Add to remaining ingredients, blending well. Place in casserole. Bake uncovered on grill with hood down for 2 to 2-1/2 hours. Enjoy the outdoors while these beans are slowly simmering on your grill. 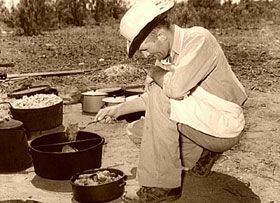 Camp Cook Marfa, TX – Lee Russell, 1939. 1 32-oz. can baked beans, 1 cup beer, 1/2 cup very strong brewed coffee, 3/4 cup chopped onion, 12 cup chopped tomato, 4 hot dogs, cut into 1/2” pieces, 1 tbs. horseradish, 1/2 cup molasses, 1/2 cup barbecue sauce. Blend all ingredients together. Place in oven-proof casserole. Bake at 300 for approximately 2 hours, stirring occasionally. Add additional beer if beans seem to be drying out. 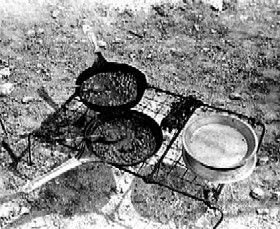 Great served at a campsite with all your other camping food. Combine all the ingredients. Blend well and place in beanpot or casserole dish. Bake, uncovered, (350) for 1 hour. There’s nothing wrong with “quick” on a hot summer day. Combine all the ingredients in a slow cooker. Add water to cover the beans. Cook on HIGH for 6-7 hours. No heating up the kitchen – let your slow cooker do all the work. Baked beans are a welcome addition to any outdoor meal. Serve them and see all the faces light up. Beans are a treat and healthy! Now that’s quite a bargain. About the Author: Arleen Kaptur has written numerous articles, cookbooks, motivational booklets, and the novel: Searching For Austin James.